I have spent the last few days organizing my craft supplies. And every time I finally do something like this, I find things I forgot I had! I dug into every drawer and looked behind every door and opened every box in the closet that I thought might have craft supplies in it. I didn’t want everything piled on my small desk because then I wouldn’t have room to work. So I organized craft supplies and put them in jars and baskets and boxes. Then I put them on my little green vintage cart so I could roll it around when and where I need it. Very handy. 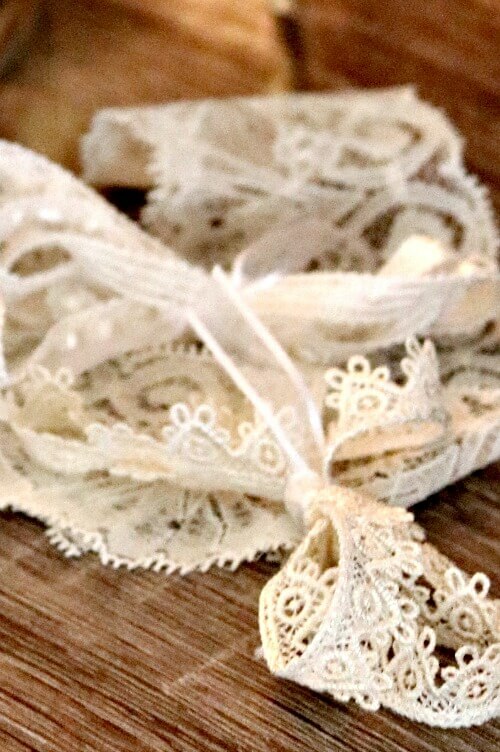 I wound up odd bits and pieces of lace and tied them with a bow so they wouldn’t get knotted up. I added a little bit of fall decor here and there while I was at it. 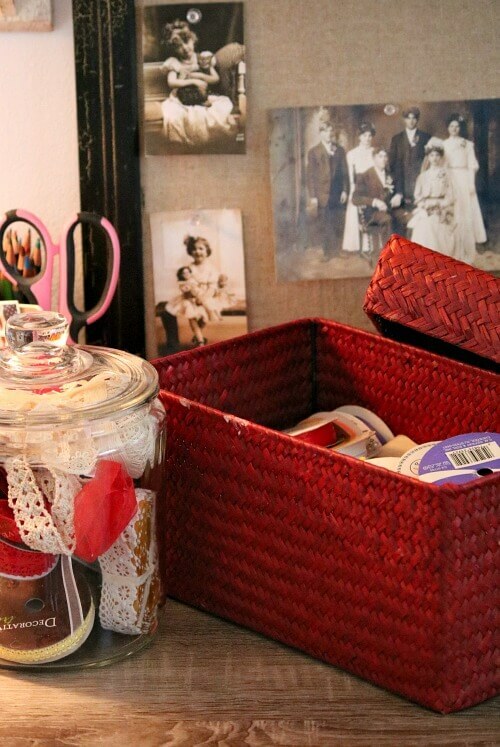 I dug three red basket/boxes out of the closet and utilized them for organization as well. I used them to hold rolls of ribbon and lace, etc. 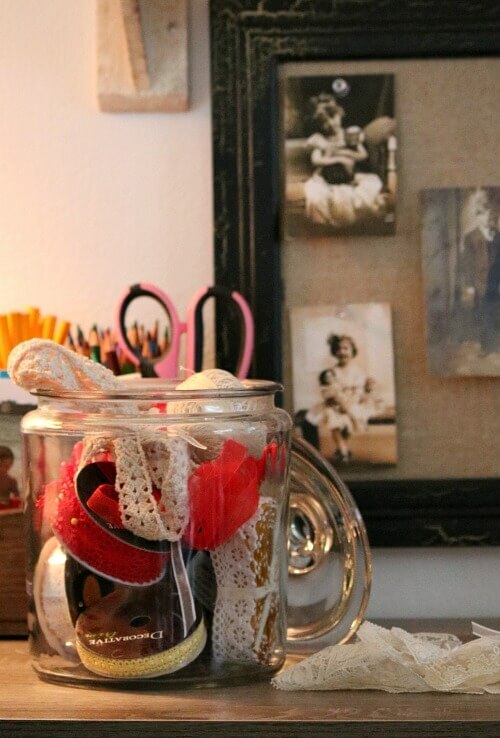 If you cut a piece of ribbon and tie it around bits of lace or fabric, it is simply much easier to store and find. 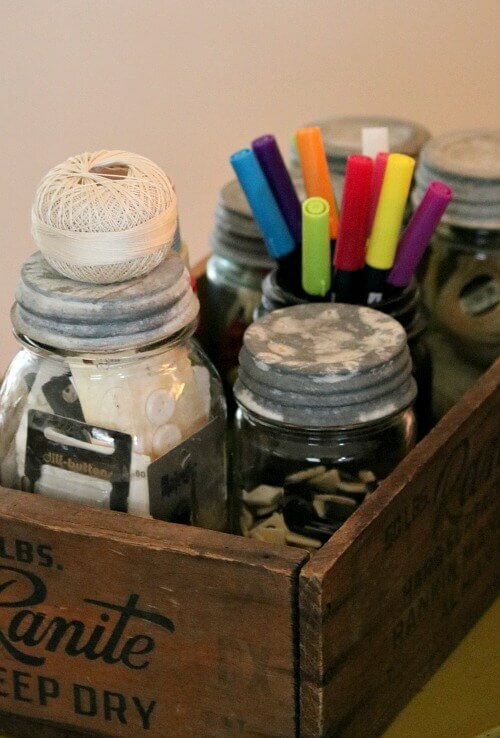 I put supplies in my vintage jars and then organized the lot of them in this vintage box. It will be so much easier to find what I need this way. 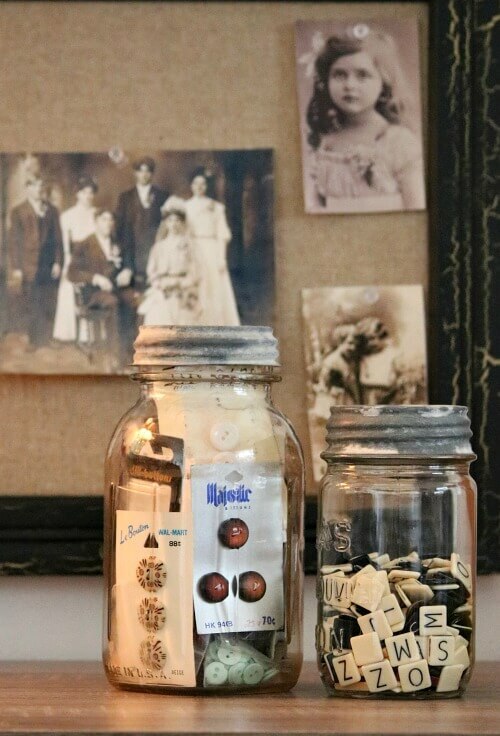 I like to make my crafts supplies look pretty as well as be functional, so why not use vintage boxes and jars for storage? It just gives everything a nice themed look, and thus storing it out in plain sight isn’t a problem. I found that I had lots of buttons still attached to cardboard. Some were new-ish and some were vintage. Not sure where I got them. It was like giving myself a gift unearthing all this stuff I forgot I had! I can keep my rolling cart with craft supplies back in the bedroom. And when I’m ready to dig into a project, I just roll it in to the living room next to my desk and I’ll ready to roll! So that’s how I chose to store my craft supplies. How do you store yours? I’m always open to new ideas. Looks nice Brenda! You have it put together so nice, that even if the cart was in your living room. It would be cute. I love to use things like that for storage too. Especially the clear jars, so easy to see what is in them. I have some things in baskets higher up on a shelf in my sewing room. So, I took some of those cream colored tags with the strings on them. Wrote what was in the basket and have it hanging on the front. Then I know which basket I need to get down. I don’t have a large sewing room. it is a small bedroom that we converted for me. Have a wonderful day! I love your idea of the tags with string. I’ll remember that one! I love that little green cart; so handy to move around where you need it. The only crafts I do and I don’t know that it is considered “crafty” is I do needlepoint/cross stitch Christmas stockings and I keep all of those kits in a huge wicker basket behind my bedroom recliner. That way, when I complete one, I simply grab the next kit and begin again. How’s Charlie? How’s your eye? Just got back from getting my left eye checked. All looks good! Yes, what you’re doing is crafts. I like your idea of the picnic baskets. I have two and have been contemplating getting them out and putting craft supplies in them too. That green cart (that I painted) is a vintage cart I got while living in Texas from a store that was closing. Your storage ideas are very helpful, Brenda. 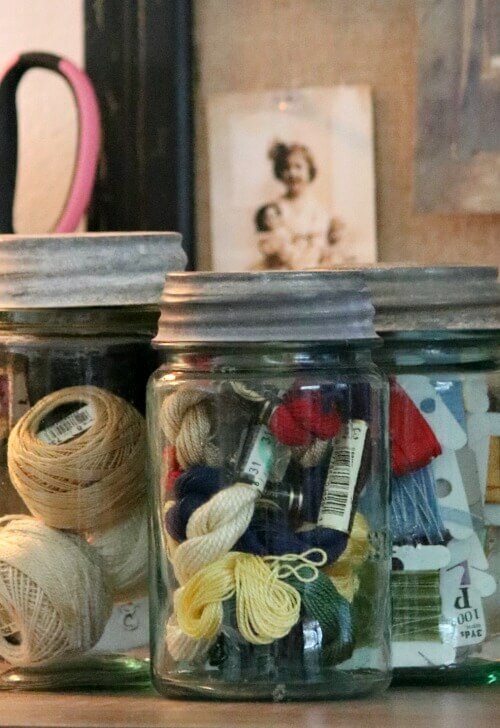 I do have buttons stored in glass jars, but for some reason never thought about putting things like ribbons or embroidery floss into jars. They look so pretty stored that way. That cart looks so useful and decorative at the same time. I can’t wait to see something you create at your new work area. Every day I’ve thought of starting a project, then something comes up and I turn around and it’s the end of the day! 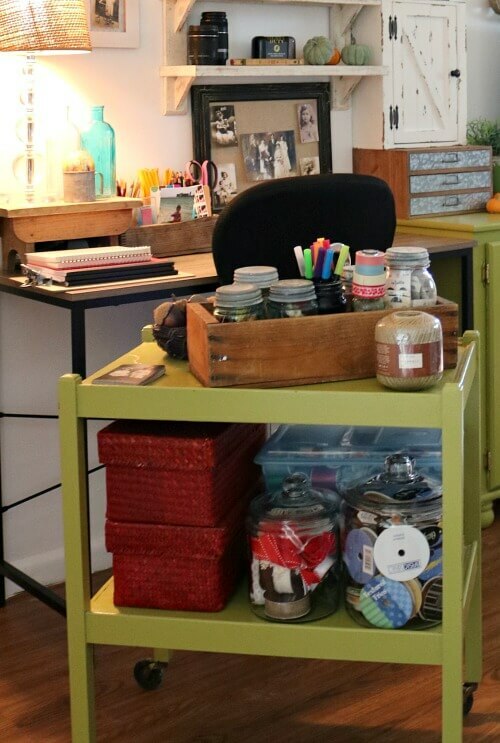 Great ideas for storage of craft supplies and I love that green cart (pretty and functional and it ROLLS). It’s a very old cart with old wheels, but it still rolls! I’m in the middle of organizing my studio and am giving away so much stuff. I will still have a lot, but at least it will be the things I really want. Clearing out and giving away really makes me feel better. It always makes me feel better too. I feel “accomplished” when I get things purged and organized. Otherwise I don’t even know what I have! You always make me feel enlighten on ways to store all my craft materials. I have so many different things that I dample in. Some times it’s overwhelming. Thanks for all your wonderful ideas! You’re very welcome. 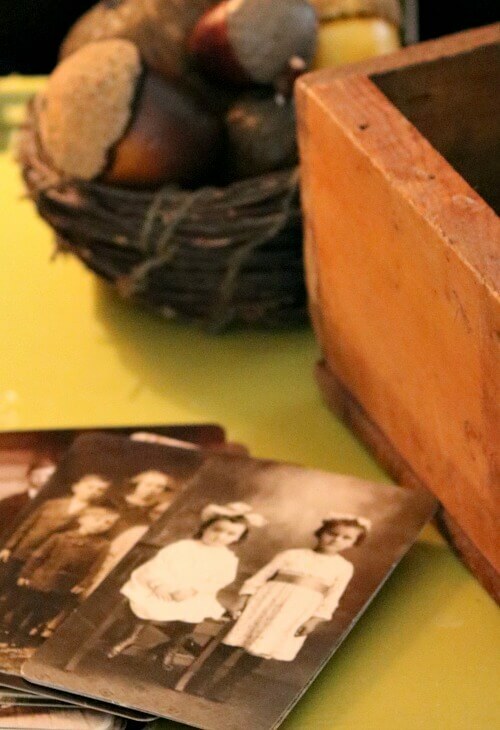 I love to use vintage storage because I can leave it out and it looks pretty. You are definitely more likely to use these craft supplies now that they are easier to access! Great idea putting them on a rolling cart! I get tired of going back and forth digging for things. Now I can just roll my cart up and I’m good to go! 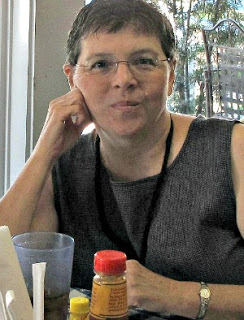 Hi Brenda, I have been reading your Blog for some time now, but first time writing. Love all of your ideas and I look forward each day to read your next Blog and see what new idea you come up with. 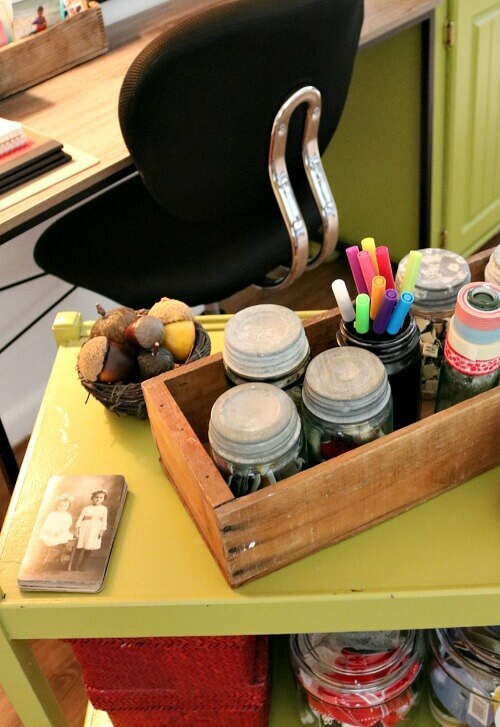 Love the Craft Cart idea and I will be on the lookout for a cart to start my own. I am trying to size down and I have a long way to go. Also love your stories about “Charlie”. He is so cute. My baby is “Hayley” She is a Cocker Spaniel, I adopted last year and she is 8 years old. Please keep all the wonderful ideas coming. Good for you for adopting an older dog. I adopted Pepper years ago when he was 7 and had him until he was 13. I loved that dog so much. He was a real sweetheart. The cart is sweet and I like that the color even matches your cabinet. 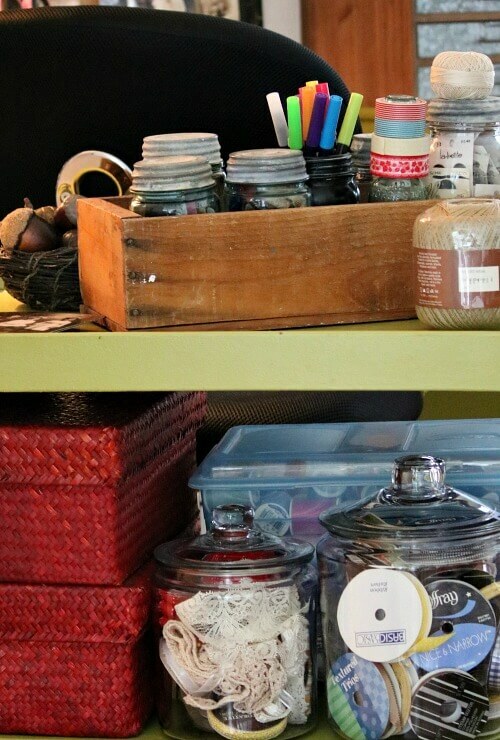 What a clever way to store your craft items; so much better than stuck in a closet! And oh I had to dig through my closets to find everything! I love your green cart and all of your supplies beautifully organized. It looks like it belongs in a showroom. I am not crafty, but I do have all of my baking things organized. You’re a wonderful baker, so I can see you having an organized baking station. You’re lucky to have a dedicated space/room in your home! Brenda you know what is so awesome. You already had all those storage baskets and jars. I love all the things that you did especially the clear jars .I love old lace used in crafts it is very beautiful .Does Charlie sleep while you craft or does he stay awake and watch you ? Glad your eyes are great and Sweet Charlie is doing well. Hugs to you both ,keep up the great work ,you inspire us all !! !